When I discovered that Delia at Postcards from Asia and Caroline at Beauty is a Sleeping Cat were hosting the Angela Carter Week from 8th to 15th June, I immediately signed up. 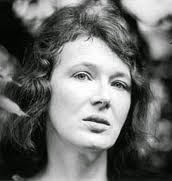 "...About five years ago she (Angela Carter) said that she had realized that she was a writer because of fairy tales, because she was hooked on narrative as a child, not by realist novels about social behavior or how to be a good girl, but by these very primitive stories that go I think a lot deeper. 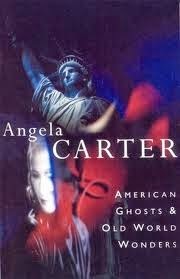 It wasn't until she said it that I felt empowered..."
American Ghosts and Old World Wonders by Angela Carter is a stylish book, a little slow but avant-garde. I've read five stories in this collection so far and it'll be easier to write about all in one three-starred review. But this story deserves a post of its own. It has some of the most imaginative, creative writing I have read in a while. America begins and ends in the cold and solitude. Up here, she pillows her head upon the Arctic snow. Down there, she dips her feet in the chilly waters of the South Atlantic, home of the perpetually restless albatross. That is an excellent sample of the kind of descriptions and metaphors Angela treats you with throughout the book. But John Ford's 'Tis a Pity She's a Whore is special. The unique story begins with a note: John Ford was an English playwright, best known for his tragedy, 'Tis Pity She's a Whore. In his time, the play was hugely controversial, and was retitled Giovanni and Annabella, after the two siblings whose scandalous incestuous affair the story follows. In her story John Ford's 'Tis Pity She's a Whore, Angela Carter has re-imagined the Jacobean play as a movie by the Irish American film director, also named John Ford, who was popular for his westerns. The siblings have been aptly renamed Johnny and Annie-Belle, and that is only the first of the many cheeky puns and tropes the story uses. It is not just a retelling, but an Americanization; one that will make you both throw your head back and laugh, and marvel at its ingenuity. The story itself is pretty straightforward. When their mother dies, Johnny and Annie-Belle are left with their father, who has no time for them, and live far away from anyone else. Silence and space and an unimaginable freedom which they dare not imagine. Their affair, which seems only natural at first, leads to suspicious rumours about town, and ends in an unwanted pregnancy. Finally aware of the 'wrongness' of their love, Annie-Belle, the good girl that she is, agrees to marry the Minister's son, who has always thought her pretty. The pregnancy becomes known only after the wedding, and while the Minister's wife swears to kick the girl out, the men of the family show her an uncanny kindness. Annie-Belle tells her husband that the father of the child is a random passerby, no one he knows. Johnny, seething with rage, jealousy, running on alcohol, sets off to set the record straight. What really stirs me is the brilliant structure of the story. It reads like a combination of a proper narrative, a script of a play and a screenplay. The action flits back and forth in time, as does the language. The alternating techniques and juxtaposing styles form a deeply interactive story, which uses its reader's imagination as fuel. Carter breaks all the rules; gives you background music, stage directions, an omniscient narrator, notes to herself and camera positions. Varying the placing of the text, playing with the indents, using the page as almost a canvas, she creates an artwork of a short story. (Close up) Johnny and Annie-Belle kiss. No. It wasn't like that! Not in the least like that. He put out his hand and touched her wet hair. He was giddy. Annabella: Methinks you are not well. Giovanni: Here's none but you and I. I think you love me, sister. Annabella: Yes, you know I do. 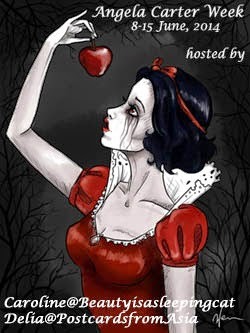 The innovative structure of this story takes nothing away from Carter's fairy tale style, which features in the other stories of this collection as well. From the simplistic "Once upon a time..."-style beginning right up to the abrupt ending, Carter leaves the reader to draw his own conclusions. But, she does depart from the plot long enough to drop observations and opinions that challenge you to take a closer look at the tragedy and its implications. Each time they lay down there together, as if she obeyed a voice that came out of the quilt telling her to put the light out, she would extinguish the candle flame between her finger-tips. All around them, the tactility of the dark. She pondered the irreversibility of defloration. According to what the Minister's wife said, she had lost everything and was a lost girl. And yet this change did not seem to have changed her. Of the other stories I've read, I like Gun for the Devil, which revolves around an old legend, about a man who makes a pact with the devil to obtain a bullet that cannot miss its target. Should you decide to read this collection, here's a fair warning: be prepared to have every expectation (and every notion of how a story ought to be) unforgivingly shattered. Oh, this sounds excellent! I'm always stunned by how Carter can write in just about any form or structure and come up with something amazing. And re-imagining the piece by John Ford as filmed by "the other John Ford" is just brilliant. I look forward to reading this story. readthegamut - You're right; I mean I only just discovered her, but the first three stories I read all had different structures. The concept of this story is great, but the execution is just as brilliant. I hope you do get around to reading it! Excellent post, Priya. I'm reading this collection as well and hope to review it tomorrow. I loved The Merchnat of Shadows best but this was a pretty ingenious story. I struggled with a few of the pieces as a lot of the allusions went over my head but whenever ine spoke to me it was so great. I love all the different ways she tells a story, deconstructs, reconstructs them . . . I very much enjoyed reading your review. It's interesting that you mention A.S. Byatt and Carter as having been friends, I didn't know that. When I thought of another writer who reminded me of Carter's prose with its unique flourishes I instantly thought of A.S. Byatt and her book, Possession. What a coincidence to read about them now in your review! Thank you for the link to the interview, I read a chunk of it but it's so long I'm going to have to read it in blocks. I wanted to thank you for adding the link to the A.S Byatt interview. So interesting. Caroline - I couldn't resist quoting that part of the interview, because it is so true, for both Byatt and Carter.I did like The Merchant of Shadows, the end completely caught me off guard, but this one stayed with me more for its construction than any of the other stories. I'm reading The Ghost Ships right now, and hope to finish the rest of the book by tomorrow. Can't wait to read your review! Delia - It didn't occur to me that their writing was similar at first, but now it sort of does. I can't believe I hadn't heard of Carter till now, but you know how when you discover something, a new word or name, it then keeps popping up everywhere? I just happened to be reading this interview the other day and found that delightful mention. It is a long interview, but Byatt has referenced so many authors and books throughout, it's worth reading just for that! I have Burning the Boats with 4 of AC's short story collections in it - I think this is one. But now I'm conflicted which few stories to try an fit in by tomorrow night!! Everyone, including you, are writing such thoughtful, amazing reviews about so many of her shorts. Thanks.